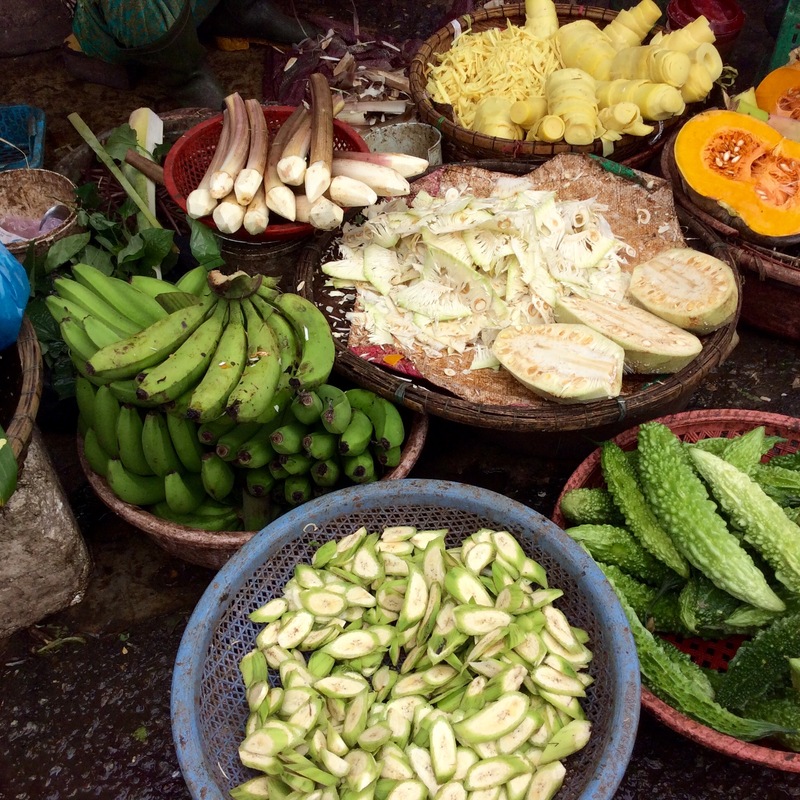 Chris Galvin | Writing about food, Việt Nam, books, and sometimes about writing. In my family, Christmas just isn’t Christmas without shortbread cookies. Both my parents loved cooking and baking, but my father and I usually made the shortbreads, creaming pounds of butter, combining it with icing sugar, cornstarch and flour, and forming the stiff dough into long, even logs of palest yellow. We wrapped each log in wax paper, chilled some and froze some. When we needed cookies, we sliced the rolls into discs, distributed them on cookie sheets, pressed a half almond or tidbit of glacéed fruit onto every other one, and slid them into the oven. My parents preferred the fruity ones, baked only until the faintest gold appeared around the edges. I went for the plain and almond ones, preferably left in a little too long—the uniformly golden-tan ones with a halo of dark brown where cookie met pan. We had two quite similar recipes, one passed down from my father’s mother, the other from a Scottish great-grandmother on my mother’s side. I believed my family’s melt-in-the-mouth rounds were the best shortbreads in the world—until I got older and tasted and adored versions from the kitchens of friends from other cultures. Some featured white sugar, others had brown, most lacked cornstarch, and most had a crisper texture than the ones I grew up with. The secret to all of them, a high ratio of butter to flour and an absence of eggs, gave them the crunchy, crumbly yet tender texture that I love—the short in shortbread that comes from all that fat preventing long strands of gluten from forming. I’ve baked icing sugar–coated almond-based kourabiedes from Greece, sablés from France, and besan and ghee-based nan khatai from India. I’ve collected friends’ recipes for butter balls and Mexican wedding balls and tiny, crumbly Iranian cookies made with chickpea flour and flavoured with cardamom. I even have a Shaker recipe for Eldress Bertha’s lavender cookies*, which I tested one summer when the lavender in my garden was at its fragrant best. Midsummer Christmas cookies. 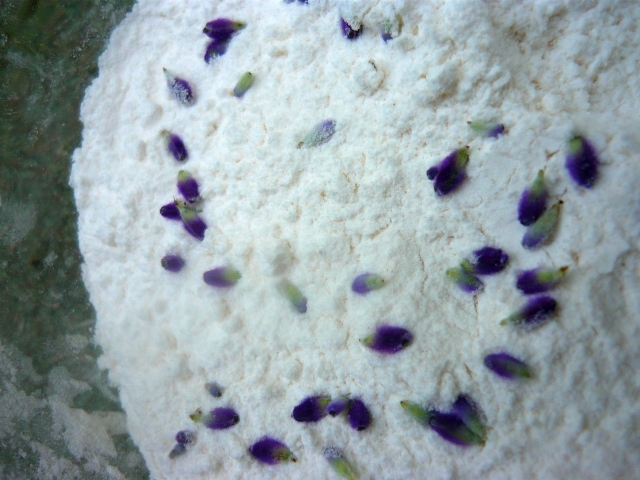 A fabulous scent permeated the kitchen when I plucked each flower from the stem and stirred the brilliant blossoms into the flour. Odd, I noted on the back of the recipe, yet intriguing. So many butter cookies to try, but I always come back to my family recipe, though I prefer a decoration of candied orange peel to the glacéed cherries my parents favoured. Over the years, I’ve experimented with them, lacing the dough with orange or lemon zest, dipping the finished cookies in dark chocolate, or giving the tops a pre-bake sprinkle of sesame or poppy seeds. The orange zest version has become a favourite. I could eat shortbreads any time, though I mostly make them at Christmas. Some years, I batch up hundreds to give as gifts. This past Christmas was the first in over a decade when I didn’t bake at least a dozen. Since becoming caregiver for a family member, I’ve had neither time nor desire to cook more than I must, but that doesn’t stop me from perking up when shortbread cookies are mentioned. I did just that when food writer and cookbook author extraordinaire Faye Levy shared images that her photographer husband, Yakir Levy, took at a recent food bloggers’ party. Among Yakir’s photos of luscious desserts, one grabbed my attention and wouldn’t let go: Rosewater Shortbread Cookies with Flowers made by Dana Levin Shrager of Foodie Goes Healthy, adapted from a Chef Lori Stern recipe. The flavouring sounded intriguing, but the flowers pressed into the tops made these cookies into works of art. In discussing the cookies with Faye, I mentioned that I’d gathered a collection of shortbread recipes over the years, including the Shaker lavender ones. Faye mentioned how difficult it is to find good fresh lavender flowers. The best bet is to grow them yourself. Properly dried ones from a herbalist might do in a pinch but if they don’t smell intoxicating, they are too old. 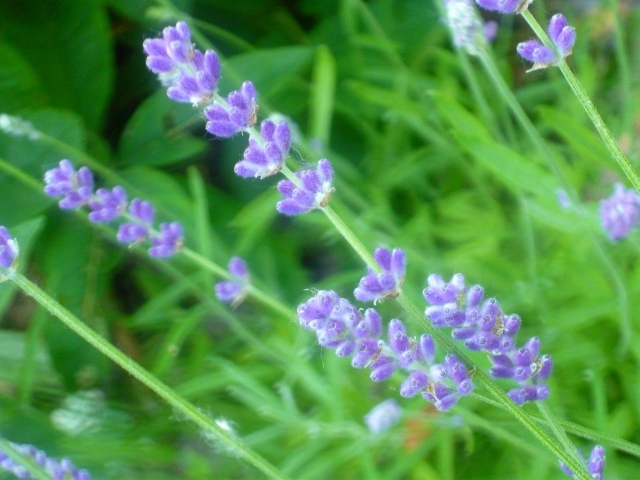 Another point to keep in mind is the wide variety of lavender species. You don’t want a heavily medicinal flavour in your food. English Lavender (Lavandula angustifolia, aka L. officinalis) has a strong but not overpowering flavour, provided you use it sparingly. My plants, pictured, are L. angustifolia ‘Munstead’, a compact variety that grows to a height of 1.5 – 2 feet and has a warm, spicy-sweet scent. I’d love to hear from readers about favourite kinds of shortbreads, especially ones not mentioned in this post. Would you try them with lavender? Hope you’ll share your shortbread stories in the comments! *The link will take you to an archive. Click on “click to view”, wait for the newspaper page to appear, then scroll down below the classifieds to read the article entitled Lavender Shortbread Cookies, a Shaker Recipe. *Note and disclaimer: When I originally posted this review, I somehow managed to leave the disclaimer out when I copied and pasted from my Word document. This note is to correct this oversight. I was one of the recipe testers for Istanbul and Beyond. I also received a copy of the book from the author as a gift with no expectation of a review in return. I’ve been enamored with the recipes from the beginning, and this blog post comes from my wish to write about that. I received no compensation for the review and all opinions are my own. “Everyday Turkish food is essentially uncomplicated, but it is never boring,” writes Robyn Eckhardt in her intro to this comprehensive cookbook. 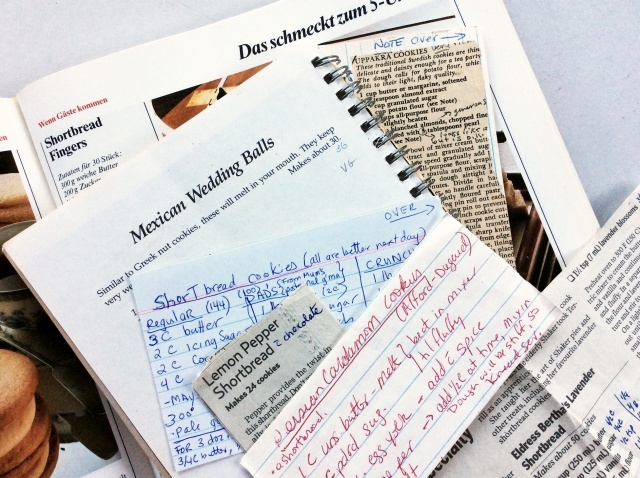 The many recipes and stories in the book’s pages back up her argument. Much more than a collection of recipes, Istanbul and Beyond is equally at home in the kitchen, on the coffee table and in the bedside reading stack. Even people who don’t cook but enjoy reading about food and places will enjoy this tour of Turkey’s many cuisines and geographies. The tour begins in Istanbul, where Eckhardt shares what a native of that city once told her: “There’s no such thing as a purely Istanbul dish.” When people from elsewhere think of Turkish food, they usually picture Istanbul’s kebabs, börek, and baklava. True to the book’s title, Eckhardt leads us well beyond, showing us the tremendous culinary diversity of Turkey’s eastern provinces. She guides us along the Black Sea coast, where anchovies, leafy greens, and fresh herbs abound. Next are the border provinces of Ardahan and Kars where Turkey meets Georgia and Armenia. Here, an emphasis on beef and dairy products is balanced with vegetables, handmade noodles and an array of dishes brought from elsewhere over the centuries. Moving south along the Azerbaijani, Iraqi and Syrian borders, we learn about wild herbs called otlar, and the yoghurts and cheeses made with them. We learn, too, about the famed isot peppers that are sundried and ground into Urfa chili flakes. In Hatay province, we are introduced to the region’s heady pomegranate molasses, bounty of olives, and intense spices. Finally, the tour heads northeast again to visit the varied topography of the central Anatolian provinces where Indian knotgrass grows wild and local cooks dry or freeze it for winter use. Eckhardt learned many of her recipes hands-on with both professional and home cooks, bakers, cheesemakers, and others. Among the recipes collected here are ones I’ve never seen before, like the simple and surprising Creamy Fig Pudding (p. 328), and Buttery Cardoons with Eggs (p. 240), a dish that has me planning to plant this relative of the artichoke in my garden this year. The recipes are clear and easy to follow. Many are simple to make and feature just a few ingredients. A few require more time and skill, but the author provides step-by-step guidance, and the results are well worth the effort. These include an outstanding Mint and Onion Börek (p. 50); fancy Coiled Poppyseed Bread (p. 326); and my personal favourite, Coiled Tahini Buns (p. 52). Fortunate to be among the recipe testers for this book, I tested the tahini buns on a warm afternoon with a soft breeze blowing through the windows. I found myself smiling as I stretched out ropes of dough along my counter, appreciating the meditative aspect. I’ve since made the buns many times. I made the Savory Coiled Nigella and Fennel Buns (p. 292) for breakfast, following the suggestion to let the dough rise before chilling it overnight, and baking the buns in the morning. These fragrant seed-dotted breads make a beautiful presentation. Both these and the tahini buns freeze wonderfully well. A spicy egg salad enlivened with a dash of red pepper flakes and the crunch of flat leaf parsley (p. 260) is on the table in 15 minutes—perfect for cooks in a hurry. An outstanding beet dish with garlicky yoghurt and walnuts (p. 317) takes more time, but most of that is spent simply waiting while ingredients cook or rest to develop flavour. Sun-dried Tomato and Pomegranate Salad (p. 269) takes only half an hour to prepare. This brilliant red, green, and white salad is a feast for both the eyes and the taste buds—a celebration in a bowl. Tahtakale Market Chicken Wings with Thyme-Chile Salt (p. 59) had my husband repeating “So good!” like a mantra between bites. As he dipped the last wing in the seasoned salt, he asked me how soon I could make it again. At Robyn’s recent book signing in Montreal, at Appetite for Books, a heady fragrance greeted me as I entered. It turned out to be Warming Cinnamon Tea (p. 205). The combination of infused spices made it perfect for the chilly spring day, and the tea surprised me with its clean finish. Bookshop owner Jonathan Cheung had also prepared Spicy Bulgar Köfte (p. 220) and chickpea flour–based Leblebi Cookies (p. 325). The köfte were tender, fluffy and moist, with a kick from a mildly spicy relish made with sweet-sour pomegranate molasses. The cookies had a tempting nutty scent and a slightly crumbly, yet fluffy texture. Their subdued sweetness made them a winner for me. This book is a pleasure to cook from. It lies flat on the counter and stays open to the recipe you started with. No annoying page-flipping while you fetch an ingredient from the fridge, and no need to hold the pages open with a heavy rolling pin. The straightforward layout features clear, readable fonts. Ingredients and headings for numbered steps are in bold text so the cook can glance over at a recipe while stirring at the stove. Finding recipes is a breeze thanks to the well-structured index, with recipes listed by both English and Turkish names and cross-referenced by category and ingredient. As well, a list of recipes by category at the front of the book makes it easy to choose a dish according to one’s needs, be that breakfast, soup, pickles, a side dish, or something else. All the ingredients are easily found at local Turkish and Middle Eastern stores, and the author provides a list of online sources at the back of the book. Only two recipes use grape molasses, so some cooks may balk at buying this ingredient, but it is inexpensive and worth adding to the pantry: the delightful Pan-Seared Sweet and Sour Chicken (p. 312) requires a half cup; the generous quantity called for in the recipe for Sesame-Crusted Bread Rings (p. 318) is the secret to the special flavour of these bagel-like breads. In the Stocking Your Turkish Pantry section, Eckhardt also mentions several other simple ways to use grape molasses. he Sweet and Sour Chicken a few times—twice for guests—and it’s always a hit, so I am already well into my second jar of grape molasses. This recipe is just one of the reasons Istanbul and Beyond is such a welcome addition to my cookbook collection and my kitchen. To join Robyn Eckhardt and David Hagerman for book signings and presentations, hands-on cooking classes and other activities, check out the schedule on their Events Page. You can find Istanbul and Beyond at your favourite independent bookstore, or at the usual online sources, such as Amazon, Barnes&Noble, and Indiebound. Viet cuisine is known for its fresh ingredients. At my mother-in-law’s table, greenery abounds, the fish and shrimp come from my sister-in-law’s family pond, and Mother buys fresh meat daily at the Đông Ba Market. Canned, bottled, and dry ingredients in her kitchen are mostly limited to the everpresent bottle of fish sauce, bin of rice, sugar, salt and pepper, and soy sauce, ruốc, and MSG. But then there are preserves. Occasionally, Mother prepares pickled mustard greens, cải chua, to serve as a side or add to a dish for flavour and crunch. At Tết, she buys or makes mứt—candied fruits and vegetables. She picks up nem chua, a sour pork preserve with a hint of garlic and chili, to serve with beer when guests drop in. Cutting white radish and carrot for dưa món preserves is a family activity—Mother, sister-in-law Ta and I spend an evening peeling and cutting enough vegetables to make several jarfuls to last us through Tết. Dưa món is an essential accompaniment for bánh chưng, the sticky rice cakes that we eat in great quantities, usually fried, during the Lunar New Year. Year-round, the one preserve we cannot do without is my mother-in-law’s Huế-style chilli paste. We use it as a table condiment, include it amongst the ingredients for fried rice, and eat it with our sticky rice cakes too. We rarely eat Huế beef noodle soup or bánh canh without it. Mother always informed me when she planned to make some so I’d be there to observe and to help. She has no written recipe for her tương ớt. (The word tương has its roots in a Chinese word that means paste, and ớt means chilli pepper.) Perhaps because I’ve been such a fan from the very first time I tasted the condiment, Mother trusted me enough to ask for my opinion on every batch. Usually, I thought it was vừa—just right—but once in a while, I’d find it so spicy I couldn’t taste the other flavours, or a bit too oily, and she’d make some adjustments until we agreed it was vừa. My husband cannot live without tương ớt made in the style he grew up with, so I prepare enough to fill a small jar—about 300 ml—every couple of months. It’s easy to make but it does take time. If you rush it, the garlic and the chilli powders can burn and become bitter, or the sugar will overcaramelize to produce a rock-hard spicy bitter candy. Oh, yum! But be patient, and make it a few times to figure out your personal preference for flavour balance, and you can’t go wrong. Following Mother’s method, I measure out finely ground dried chilli powder and about half as much of a coarsely ground seedy one for a total of half a cup. I chop and cook two or three garlic cloves and two shallots in plenty of oil on medium heat until they are dryish and golden, then lower the heat and add the chilli powders and more oil as the mixture absorbs it. I add a tablespoon of fish sauce, which foams up if the mixture is very hot. With the heat on very low or even off, I add a generous tablespoon of sugar, stirring until it melts and thickens the paste. If it doesn’t thicken I turn the heat on again briefly. A bubble or two may rise to the surface, but I don’t let it simmer lest it turn to candy. I sample a tiny taste, on a spoonful of rice if I have some around, and make adjustments if needed. I prefer to use Thai palm sugar, pictured above, grating a disk into a fluffy, sticky pile of sugar. When measuring, I tamp it into the measuring spoon but I don’t pack it in hard. Rock sugar and white sugar work too, and the exact amount is whatever pleases the taste buds. Making changes at this point can be tricky, resulting in that hard candy I mentioned earlier, so usually my only adjustment would be to add more oil if the mixture is too thick. More fish sauce could be added if a saltier or more pungent flavour is desired. When the chilli paste has cooled down, I spoon it into a glass jar and admire the lovely deep red colour, which you can see in the header for this post. The oil rises to produce a film on top, which is handy for when you need a bit of chilli oil to flavour a dish. It keeps well for a couple of months on my counter as long as we make sure to use a clean spoon to scoop it out. The cooking process drives much of the moisture content out of the onions and garlic, and the sugar and oil give it a reasonable shelf life. However, if kept too long in a hot kitchen or beside an oft-used stove, the oil may start to go rancid. At my house, the biggest challenge is to make sure the jar is never empty for long. Turbulent. Overwhelming. That’s what this year has been, on the grand scale and in my own day-to-day life. With little time to write in 2017, I chose to concentrate on query packages for my memoir manuscript. Submissions-wise, I sent out one flash fiction contest entry. Someone else won the prize and I went back to researching publishing houses. For the first time in nearly a decade, a year was about to close out without a single new publication credit for me. And then…writer-editor-publisher rob mclennan to the rescue…though he didn’t know about the rescue aspect when he invited me to contribute an essay for his my (small press) writing day blog project. My little essay went live a few days ago. Yay! A guest blog post does count as a publication, right? Modelled after The Guardian’s occasional feature “My Writing Day,” rob’s project offers an opportunity for “those of us who might never appear in The Guardian”. What amazed me, on reading through over a dozen essays on the blog (there are over 40 and counting), was how varied people’s writing days are. Some writers simply park their butts just about anywhere and start writing; others have rituals to get them into the zone. Some write for hours at a time; others write in brief bursts shoehorned in between making breakfast for little ones, getting them off to school, picking them up again for lunch, baking banana bread with them . . . much like rob mclennan himself. His description of what his writing days looks like is longish, and in the form of a one-day snapshot, but the form and detail are perfect for illustrating how one can fit writing and writing-related work into a busy, busy life. Happy reading and writing in 2018, everyone! Imagine the show is called Mr. Bear’s Violet Hour Saloon, and the tagline is “where the sky is evening-gorgeous, the drinks won’t cloud your head, and the cocktail nuts are poems.” The format is strong, and the tagline seals the deal: you become a regular listener. Imagine that you are scrolling through Twitter when a notification comes through: something you wrote will be featured on the show in one hour! New VioletHourSaloon forecasts showers of good work, 8pm https://t.co/XiARkjy9ND! @ChrisGNguyen @SandyLonghorn @Martelli89 @poetthink &more! With all the crazy weather thanks to hurricanes in the Caribbean and the US lately, no wonder this week’s theme was rain and floods. I really enjoyed the readings and lots of new-to-me music. Unfortunately, I missed the first twenty minutes—only to discover Mr. Bear had opened with two songs followed by my piece, Flood Season (published in Asian Cha’s March 2012 issue, and chosen as a finalist for that year’s Sundress Best of the Net Anthology.) I looked forward to hearing the podcast the following day. At around the eight-minute mark, I heard the opening lines of Flood Season. A few paragraphs in, I thought: What a gorgeous reading! I continued listening. Just the right rhythm and lilt. Emphasis in the right places. Quite possibly better than I could read it myself. The Violet Hour Saloon has nailed both for me. The show introduces me to great work by writers I had not previously come across, and pieces that are new to me by writers I admire. And I was thrilled to learn that my little memoir piece mattered enough to a well known, well loved powerhouse in the literary community that she read the whole piece on Boston Free Radio. It couldn’t have come at a better time—I’ve been so busy with life and with putting together query packages for my manuscript that I haven’t submitted any writing anywhere this year, except for one contest. (I didn’t even make the shortlist.) It’s such a lift to know that people are still reading and hearing my writing. I’ve heard some great poetry, fiction and nonfiction, old and new, on the show, but Georgia’s own writing is well worth a read. I love her short yet many-layered memoir piece Family Interpreter, recently published on The Coil. Love, Cliff, in the Summer 2015 issue of People Holding…, surprised me with its unexpected angle. Surrenders, in issue 24 of Literary Orphans, is full of beauty and melancholy. You can learn more about Georgia and Mr. Bear in this lovely interview with Synaesthesia Magazine. They tweet as @MrBearStumpy. Thanks to Mr. Bear for permission to post his photos here. In the Việt kitchen, the letter X is tasty. I considered writing about xào, stir-frying, or xoài, mango, or perhaps xôi, sticky rice. Then my in-laws sent a huge package of goodies from Huế. Among the many local specialties were two kinds of mè xửng, a sesame-coated nougat-style sweet made with peanuts, sugar, malt syrup and rice flour. It reminds me of peanut brittle, but soft and malleable, and much less sweet. Mè means sesame. Xửng is a steamer tray, and some people say this was the traditional container for holding the freshly made candy. In some dictionaries, xửng is defined as the way sugar is cooked down—not quite caramelized—when making mè xửng. Huế people call the candy a symbol of their city, and give this local specialty as a gift for friends and family who live elsewhere. At Lunar New Year, I often spot it in the trays of sweets offered with tea for guests. Even my husband, who does not care for it, says there’s something special about the candy that reminds him of home. I can see why—one of Huế’s oldest and most popular mè xửng companies, Thiên Hương, is just around the corner from where he grew up, and we see their sign, the big blue and red letters appearing to float on the skyline, every time we cross the Gia Hội Bridge on the way to his parents’. Recipes vary, but not greatly; confectioners and home cooks follow a basic method. White sugar is poured into a large pot, followed by a slurry of rice flour combined with water, and the mixture is stirred over heat to melt the sugar. (Rice flour is usually used, but I’ve seen recipes with tapioca flour too.) At this point, some candy makers add lime juice for extra fragrance. The mixture must be stirred constantly with a wooden spoon or spatula to prevent sticking and burning. After ten or fifteen minutes, a dough forms, comparable in density to a thick Béchamel. If the cook is preparing a large amount of candy, more sugar might be added now. After another ten minutes of stirring, scraping and folding with the wooden utensil, the cook reduces the heat and pours in the malt syrup, stirring all the while, and the candy turns golden brown. To test for readyness, a chopstick is dipped into the bubbling mixture and lifted out. The candy should form a thin sheet hanging from the horizontal chopstick. (I’m guessing that this is probably somewhere around the firm to hard ball stage, 244° to 250°C°). The sheet is waved back and forth to cool it quickly, then gathered between the fingers. If it’s soft and maleable but barely sticks to the hand, it’s time to fold in the freshly roasted peanuts, usually chopped or ground roughly. A wooden spoon in each hand makes pushing the candy back and forth in the pan easier. Now it’s time for the fragrant, toasted sesame seeds. These are spread in a thin layer on the work surface, traditionally a nia, a large, flat, round tray. The candy mass is scooped out of the pot and placed atop the seeds. Left to cool for five minutes, it flattens and spreads into a shapely circle. The candy maker flaps over the circle’s edges on four sides to form it into a square, flips the candy to coat it entirely in seeds, and positions a square wooden mold over it. With a wooden pin, the mixture must be rolled and pressed to fit the mold and embed the sesame seeds. The mold is removed and the cook continues to roll and press until satisfied that enough sesame is embedded in the surface. After it sets and cools awhile, around 30 minutes, the candy is cut. If pressed into U-shaped curves with the fingers, the mè xửng should be soft enough to slowly relax and become flat again. After the cut edges are pressed into the sesame seeds, the candy is wrapped. In the past, candy makers cut mè xửng into small squares and wrapped the sweets in banana leaves, but now plastic wrapping is typical and candy makers offer other shapes and textures too. Mirror mè xửng, black sesame mè xửng, and especially, crunchy mè xửng are popular variations. The crunchy kind is a little less sweet and, instead of sporting a sesame-seed coating, is sandwiched between two toasted bánh đa (rice crackers). I like these best. When I bite into one, the crisp cracker and mild candy melt in my mouth, a pleasant contrast of textures. Perfect for sharing with a group of friends over a steaming pot of tea! Over the years, various pregnant friends and relatives in Huế have told me they worried about how their skin would look afterwards. Almost all of them used a postpartum mask of fresh turmeric, usually prepared and applied by their mothers-in-law, to heat the body, soften the skin and clear away acne and even melasma, the blotchy brown facial discoloration sometimes called the mask of pregnancy. A member of the ginger family, turmeric has antioxidant and anti-inflammatory properties. Several varieties grow in Việt Nam. Perhaps the most common are those referred to as yellow turmeric (the one most familiar in the West), red turmeric (with its deeper orange flesh verging on red, and a darker peel), and black turmeric (for medicinal uses only, with a very dark skin and purplish flesh). Both the fresh rhizomes and dried, powdered turmeric are used for cooking and curative purposes. My family mainly uses the yellow variety, Curcuma longa. These roots were for sale at Huế’s Đông Ba Market. “Did your skin turn yellow?” I asked Trinh. In Việt Nam, turmeric has a long history as a healing agent, used both internally and on the skin. Andrea Nguyen, in her first cookbook, Into the Vietnamese Kitchen, mentions that fresh turmeric “was traditionally rubbed on cuts or bruises to promote healing.” Today, turmeric skin creams are sold for treatment of mosquito bites and heat rash, prevention of scars, and more. Some friends in Huế use masks made with fresh or powdered turmeric to cure acne, although as Oanh discovered, it can also cause acne in people with a sensitivity. Việt Nam has recently become one of a handful of countries using nanotechnology to produce a turmeric-based drug called Nano-Curcumin, used to treat cancer. Curcumin, the anti-oxidant, anti-inflammatory chemical in the plant, can suppress growth of cancerous cells, but it isn’t easily dissolved in water and therefore not easily absorbed in the body. Combined with nanoparticles, the curcumin becomes more bioavailable. The vibrant colour and earthy flavour of turmeric feature in various Vietnamese dishes, from stews and curries to the southern bánh xeò (sizzling pancake—a crispy yellow pancake stuffed with fresh herbs, pork and shrimp) and its smaller, denser Huế cousin, bánh khoái (happy pancake). To make the batter for bánh xèo, I combine dried turmeric with rice flour and coconut milk. I made these bánh xeò—as I always do—based on Nicole Routhier’s recipe in The Foods of Vietnam. I also love her recipe for bánh tôm chiên, crisp nests of sweet potato and shrimp with a whisper of turmeric. Here’s a shot of some bánh khoái I enjoyed at one of my fave places for this dish in Huế (Bánh Khoái Hạnh, 11 Phó Đức Chính). From the north comes chả cá (turmeric fish with fresh herbs), and from the eponymous Hà Nội restaurant, the famous Chả Cá Lã Vọng, so delectably described by Kim Fay in Communion: A Culinary Journey Through Vietnam. Andrea Nguyen offers a delightful and easy version of chả cá in Into the Vietnamese Kitchen that features notes of turmeric, galangal and dill. 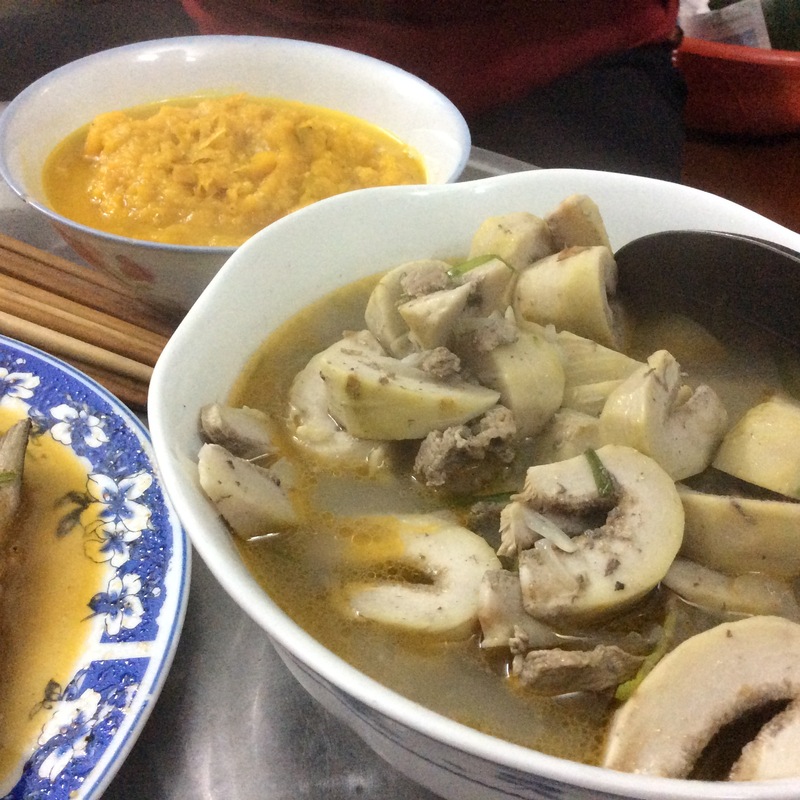 My cousin-in-law Thủy makes a wonderful vegetarian curry loaded with potatoes and carrots, while sister-in-law Ta makes lòng xào nghệ (bún noodles with turmeric and offal), a popular Central Vietnamese dish for late-afternoon snacking or for nhậu (drinking beer or other alcohol and snacking). Lòng means variably the organs in the abdomen, the intestines, bowels or guts, but it figuratively means the heart or soul. In English, you have a good heart, learn something by heart, or have a broken heart; in Vietnamese, you have a good gut (lòng tốt), learn by gut (học thuộc lòng), or have pain in the gut (đau lòng)—or as my go-to online Viet dictionary puts it, you “have heart-breaking bowels.” Hm, lost a bit in translation there…or maybe gained something. Whenever anyone mentions bún xào nghệ, I picture Ta grating vibrant orange mountains of turmeric, her hands tinted deep yellow. It’s best to wear gloves when handling turmeric, and use glass or steel implements. It will leave a stubborn residue on these materials, but with hot, soapy water, the orange-yellow film can be removed. It will, however, stain plastic irrevocably. If you stain your hands, rubbing with either sugar, oil or lemon juice is said to clear up the colour, but I’ve had no success with any of these. If, like me, you still can’t get rid of the stains, you could try Caroline Lange’s suggestions on the Food 52 blog. I asked several friends and relatives for their bún xào nghệ recipes. My friend Hiền sent me a video of herself making the dish, but since I can’t upload videos on this blog (one day I’ll upgrade to the paid version), I took a still (below) of her sautéeing the offal with turmeric. When I asked my sister-in-law for her recipe, she explained her method and said, “If you like a particular ingredient, put more.” Three relatives offered estimates of the quantities they typically use, from which I’ve compiled a list of ingredients with approximate measures, followed by Ta’s instructions, a note, a link to a cold-busting turmeric tea, and a few words on growing your own. Rinse offal with coarse salt. Scrape peel off the turmeric (with a spoon or the blunt edge of a knife), then grate the root. The quantity depends on how much you like turmeric—if you love it, put more. One rice-bowlful (about 3/4 cup) should be just right for two to four servings. You need a lot because the turmeric will shrink when you sauté it. (My mother-in-law, on the other hand, says a bowlful is too much for two servings, and recommends “one lạng” of turmeric. Which presents another problem: depending on whom you ask, a lạng can be 100 grams or about 38 grams, a confusion arising from old and newer measuring systems.) Chop garlic and onion. Heat oil in frying pan. Sauté garlic and onions until aromatic. Add grated turmeric and keep stirring until the mixture starts to get dry and tends to stick. Add flavourings: fish sauce, msg, hạt nêm (flavour granules)* ground dried chilies and some chopped fresh chilies, according to taste. It should be a little salty. Finally, add fresh (or soaked and cooked) bún noodles. Toss to combine well and allow the noodles to absorb the flavours. Taste to see if it needs salt. Add rau răm (persicaria herb, sometimes called Vietnamese coriander, pictured below) and green onions and toss again. All that’s left to do, says Ta, is get it into some bowls! *My in-laws use this chicken flavour hạt nêm and this mushroom-flavoured one, but several other companies make various versions too. 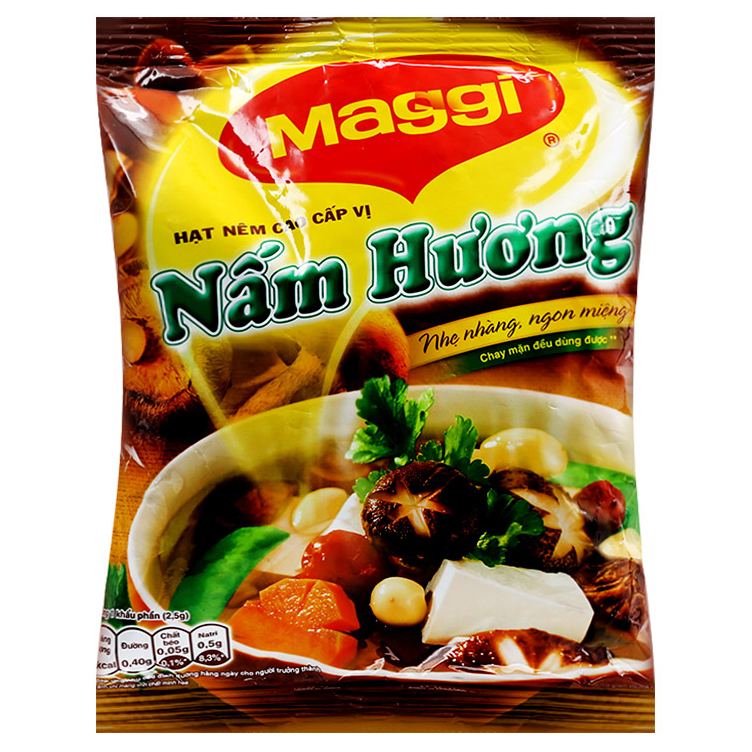 While hạt nêm literally means flavour granules, the product seems to be very similar to, if not the same as, instant broth base in the West. Usually, only a tablespoon or so is added to a dish that will serve a whole family. Most hạt nêm contain plenty of msg and salt, so those on low-sodium diets would probably prefer to omit it. After going on at length about bún with turmeric and offal, I must admit that as a non-fan of offal, I do not crave this dish. My in-laws sometimes do though, and the colour and texture are so appetizing that I am happy to share the offal in my serving with the others, and gobble down the noodles. My friend Thạch suggests asking for the bún nghệ cháy—literally, burnt turmeric noodles—the layer of noodles from the bottom of the frying pan, almost burnt, crisp and intensely flavoured. In Việt Nam, fresh turmeric is used to prevent or fight colds and sore throats. Slices may be candied, or boiled and the resulting liquid mixed with sugar for a hot beverage. Robyn Eckhardt wrote about her personal experience with the magic of Vietnamese candied turmeric a few years ago. Her method for making it sounds much like the way it’s done in my family and—bonus—the turmeric cocktail recipe she developed to use up the leftover simple syrup is a winner. Robyn’s husband, photographer David Hagerman, has developed a turmeric-based cold-fighting tea that works. Despite fairly robust ingredients, Dave’s Miracle Tea has a delicate flavour and aroma, and is comforting to sip when a cold threatens to ruin a week of your life. I batched some up last week. Here are the ingredients, a little blurry in the steam rising from the pot. Turmeric is easy to grow from fresh rhizomes bought at a health food store, especially if they already have tiny growing nubs. Give the rhizomes a quick rinse and pot them up. Keep the soil lightly moist, not soaked. It can take a while for the shoots to push through the soil. During this stage, too much water will rot the roots. I plant mine in tubs that I can put outside until the temperature falls to around 10°C in fall. I harvest only pieces the size I need, trying not to disturb the rest. When I bring it in for the winter, sometimes the leaves all dry up and fall, and sometimes a few keep growing, much like the ginger I grow the same way. Both turmeric and ginger roots keep very well in soil—much better than in the fridge or on the counter. Here are some turmeric plants about two months after I planted the rhizomes. Both turmeric and ginger freeze well, so a good option is to buy them when they look fresh (plump, not wizened and dry-looking), give them a rinse, let them dry and pop them into the freezer, ready for grating or slicing off just the amount you need. For some dishes, though, nothing beats the fresh roots, and in my mother-in-law’s kitchen in Huế, which didn’t even have a fridge until around ten years ago, only fresh turmeric will do. Between 4:30 and 6:30 a.m., the streets of Huế abound with people walking, jogging and excercising. When in Việt Nam, I’m often outside by 5 for a walk with my mother-in-law. . . When I took this photo of a group warming up in front of Huế’s flag tower, I could only just discern the flag in the mist. This image is part of my photo set Canada, Việt Nam, published in the June 2016 issue of Asian Cha. To see the other five images and read about them, please click the link. My thanks to the editors for kindly including the set. I’m pleased to announce that my personal essay Bombshell has been chosen as runner-up for the 2015 creative nonfiction prize in Briarpatch’s fifth annual writing contest. Thank you to Leanne Betasamosake Simpson, who judged the creative nonfiction entries. Bombshell faced some serious competition. The winning CNF entry, Living Death by Siku Allooloo, held me glued to my screen, absorbing the words. When I reached the end, I read the piece a second time. Laurel Albina’s thought-provoking poem Energy Series: Surface Mining won the poetry category, with Phillip Dwight Morgan’s powerful piece Free Trade Agreement chosen as runner-up by poetry judge Stephen Collis. Iryn Tushabe won the Best of Regina category for her story Gone. Congratulations to the winners, whose pieces have been published in the March/April issue of Briarpatch, available now. I can’t wait for my copy to arrive! Congrats, too, to my fellow runner-up. Read more about Briarpatch, an award-winning Canadian magazine of social justice, politics and culture, on their website. And do pick up a copy if you can! This is a magazine of writing that matters. We tend to think of Vietnamese cuisine as a single entity, but really it’s made up of many regional dishes and ingredients. The cooking of Huế features a variety of such foods, and a variety of locally grown fig is one of these. 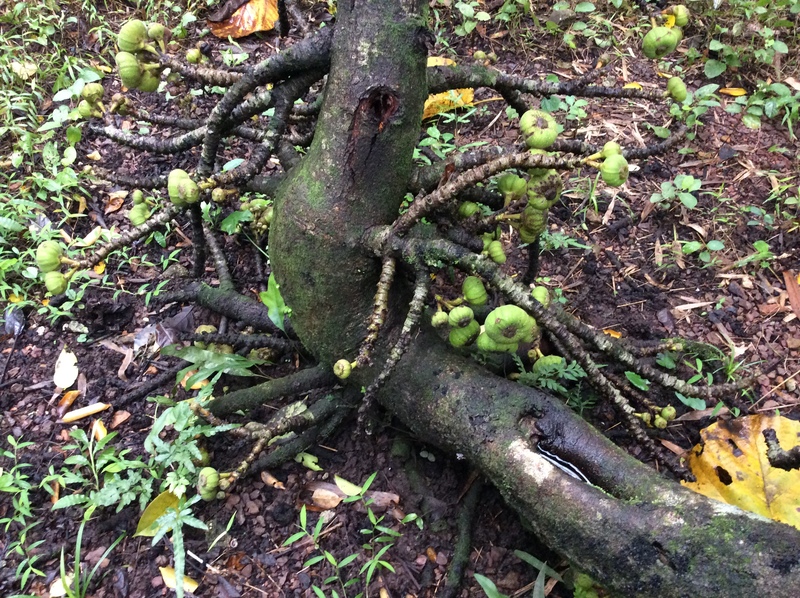 The vả fig, Ficus auripculata, is only cultivated in the central region of Việt Nam, although it’s also grown in other parts of Asia, including China, Thailand, and Malaysia, as well as in Australia. Vả are picked well before they are ripe, while still bright green on the outside, with white flesh surrounding a hollow pink centre. At this stage, they are hard, crunchy, faintly sweet and a little bitter. Their flesh is somewhat meaty, somewhat nutty. In Vietnamese, this mouthfeel is described as bùi, a word that has no equivalent in English but is sometimes translated as “rich” or “nutty”. They are also quite astringent, like a green banana. In Huế, several different dishes are most typically prepared with this fig: raw vả are combined with slices of green bananas as well as unripe star fruit and assorted herbs and lettuce to accompany bánh khoái, a crisp rice pancake filled with pork and shrimp, or nem lụi, grilled pork sticks, or with a side of tôm chua to eat with thinly sliced boiled pork; they are made into a spicy blended appetiser/salad served with crunchy rice paper crackers, popular for both meals and snacks and as a dish served to accompany beer; they are used in soups and kho dishes (which are eaten with rice and have a thick, salty sauce). These dishes are sometimes called poor people’s food because the figs are so affordable, but in reality, all of them are seen both on the family dinner table and in expensive restaurants. Vả trộn, a favourite salad-type dish in central Việt Nam, is mildly sweet, mildly salty, and spicy according to taste. 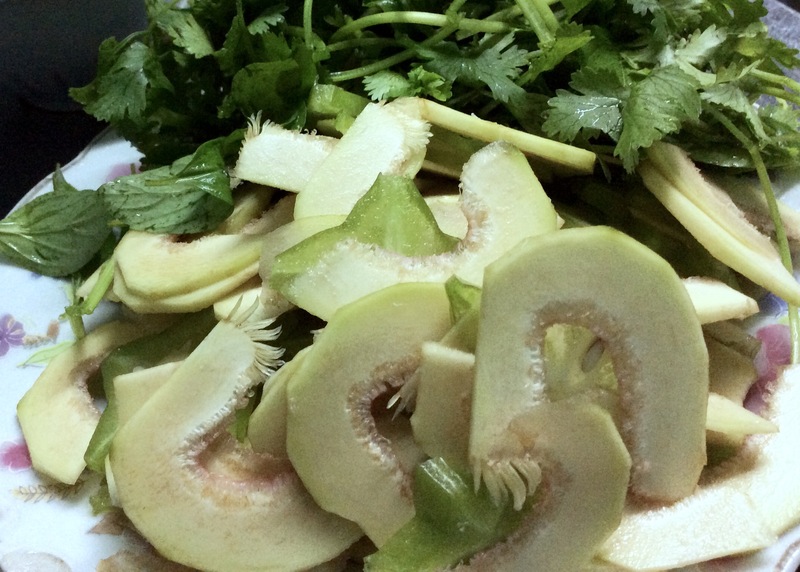 If you want to prepare this dish, boil the vả until quite soft, then peel and slice very thinly. Drain and then squeeze them to remove excess water and work the figs gently by hand until they begin to fall apart. Toasted sesame seeds, boiled shrimp and lean pork cut into thin oblongs, fish sauce, salt, pepper, powdered dried chilis, and if you are a true Huế cook, a little MSG, are necessary flavourings, as are shredded mint and persicaria leaves (rau răm). Combine everything and top the salad with coriander leaves, caramelised sliced shallots, green onion sections, and toasted lightly crushed peanuts. Serve with bánh tráng (crunchy toasted rice paper crackers). Invite guests to break the crackers into pieces big enough to scoop up mouthfuls of the salad. No need for forks or spoons. Vả kho sườn heo is a simple dish of stewed pork ribs and vả figs. In the old days, this type of stewed vả dish was commonly served to nursing mothers, because people believed that it helped increase milk production. The vả tree is unusual in that the fruits develop in bunches on stems born right on the trunk and branches, just like jackfruit. Its beautiful large leaves make it a good shade tree even if it doesn’t grow very tall. I’ve seen vả trees in people’s courtyards,in the woods, and at possibly every pagoda I’ve visited in Huế. The trees are easy to grow, require little care, and produce fruit pretty much year round, though the main season is from December to March, bracketing the Tết holidays. The raw figs were never a favourite for me, but after over ten years of nibbling at them, I’ve learned to like them. The spicy salad, on the other hand, I’ve never had trouble eating. When served raw or prepared for pickling, vả should be peeled and bathed in salt water to prevent oxidization turning them brown, then either cut into thin slices for salads or brined before pickling. 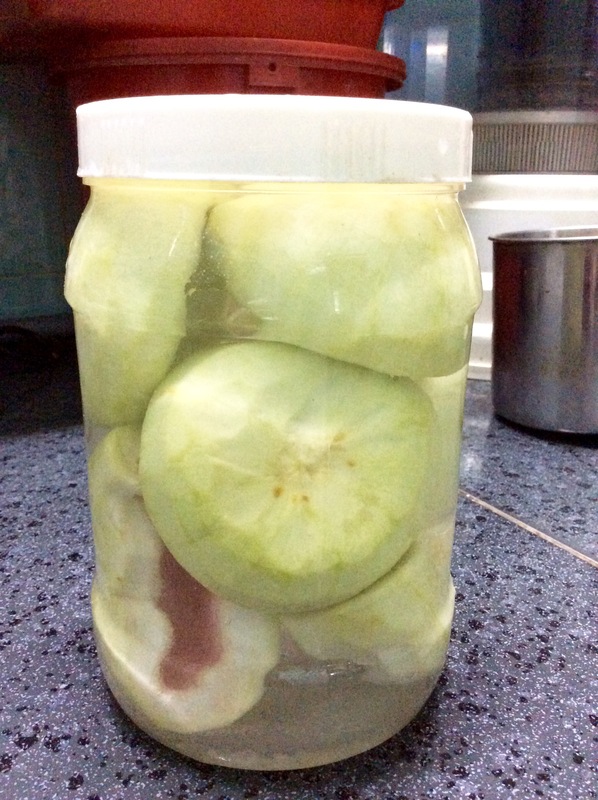 My in-laws and neighbours in Huế often prepare sweet and sour vả pickles for Tết. We put up several jars of them to serve guests during Tết celebrations for the Year of the Monkey, which began yesterday, February 8. Happy Lunar New Year!